Bear these tips in mind to avoid the bear baring his teeth. Don’t know which bear? It’s the one bearing the bared tray. Much of language is learned through hearing and practice – through conversation. We rely on context to give meaning, but what happens when we’re led astray by what we hear? Misused words and poor grammar. e.g. – Latin abbreviation for “exempli gratia,” which means “for example.” Use this abbreviation when providing a list of examples that are not a part of a finite series. Incorrect: Greg is a huge fan of cyborgs, i.e., the Terminator, Inspector Gadget, and RoboCop. Correct: Greg is a huge fan of cyborgs, e.g., the Terminator, Inspector Gadget, and RoboCop. i.e. – Latin abbreviation for “id est,” which means “that is.” Use this in place of “in other words,” when you’re making something more clear, or when providing a finite series. Incorrect: Standing behind a horse can result in broken ribs, e.g., you’re more likely to get kicked. Correct: Standing behind a horse can result in broken ribs, i.e., you’re more likely to get kicked. accept – to consent to receive; to agree to undertake. Incorrect: I except your challenge. Correct: I accept your challenge. except – not including; other than; to exclude; a conjunction that conveys an exception. Incorrect: Need advise? We’ve got answers! Correct: Need advice? We’ve got answers! *Tip: Advice is a noun that can be singular or plural, like moose. advise – to offer suggestions; to recommend. Incorrect: We can advice you on all of your legal needs! Correct: We can advise you on all of your legal needs! 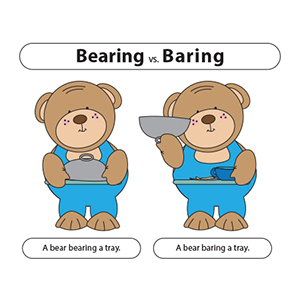 bear – to carry (i.e., physically or mentally); a mammal with thick fur and a short tail (e.g., grizzly bear, and teddy bear). Incorrect: Bare in mind, you should never trust a bear. Correct: Bear in mind, you should never trust a bear. bare – not clothed or covered; to uncover; to expose. Incorrect: My bear hands turned blue in the cold. Correct: My bare hands turned blue in the cold. forth – out from a starting point and forward or into view. Incorrect: From that day fourth, Gerald never looked at eggplant the same way. Correct: From that day forth, Gerald never looked at eggplant the same way. fourth – a quarter; constituting number four in a sequence; 4th. Incorrect: A forth of the sales can be attributed to cats. Correct: A fourth of the sales can be attributed to cats. As always, we are on the hunt for more and more commonly misused words to help you achieve 100% error-free articles. If you have any misused words you’d like to see added to the Top Misused Words series, get them off your chest! Share them in the comments section below. Not familiar with this series? Check out Top Misused Words Parts I, II, III, and IV for more great proofreading and grammar tips! Re. advice / advise … in English English there’s a simple ‘rule of thumb’ to help with this …. “you can see (‘c’) a noun but you can’t see (‘c’) a verb”. Advise/advice is such a pet peeve of mine, I’m tempted to say it deserves its own post! I can’t count the times I’ve seen people offer “advise” on a product or service, or end an inquiring e-mail with “Please advice.” I’m glad you guys included this one, because it can really undermine credibility, whether it’s used incorrectly in an article, or just in everyday communications. Beautifully succinct list of common mistakes – thanks! I prefer to see a semicolon before i. e. and e g. when they introduce independent clauses. Also, I think a dash is the best punctuation before i. e. and e. g. when they introduce a list of items. I’m not saying commas are wrong; I’m merely expressing personal preferences. Yes, and when are people going to learn the difference between loose/lose; looser/loser? That one drives me nuts. Yes, using loose when you mean lose. Drives me nuts too. Also saying “could of” when you mean “could have.” How about “angry at” when it should be “angry with.” And using apostrophes when they’re not called for, e.g. using it’s when you mean “its” and one of my big pet peeves, using “your” when you mean “you’re”or vice versa. I’d really like to know the correct use of passed and past. The car went passed? Past? As I went passed? Past? “Passed” is the past tense of the verb “to pass” .. so a car PASSED me, or it was stationary as I PASSED it. You are correct. Simply put, past refers to a point in time, an historical happening while passed usually means motion. I’ve been banging my head against the wall for years trying to get others to use these terms correctly (especially e.g. and i.e.). Perhaps your column will make a difference. As for the use of ‘e.g.’, I’d add that one should not use ‘etc.’ with the list. (You don’t, Penny, but others do.) By saying “for example,” the person is stating that what follows isn’t a comprehensive list but instead a handful of examples. You caught us! You have good eyes and a clear grasp of the English language. You’ll note that we’ve since corrected our error. Thanks for bringing it to our attention. Great clarification! Keep ’em coming! Thanks. Excellent Article! These are common mistakes made on Written English. very good information. “e.g. vs. i.e” was a big eye-opener for me. I always used “i.e.” to mean, “for example”. But now I see that I am wrong. But now I know. Thanks! Figuring out what word to use can be tricky at times, thanks for clearing things up with this article. Gosh, I finally nailed e.g. and i.e. For a long time I’ve been wondering the difference and never bothered to look it up. One of the most common errors I see when reading material apparently produced by US writers is the use of “loose” instead of “lose”. I saw it so frequently at one stage that I asked an American friend if Americans used loose instead of lose. You know what he told me, don’t you? Thanks for bring up these commonly misused words, I am guilty of misusing advice and advise, I hope I will remember to use them correctly now. How about misusing lose, loss and lost. I am sometimes at lost when to use lose and loss and lost, can you help with this? Also, it would be a good idea for you to review the rule about stringing independent clauses together with commas. You can’t do it. “Loss” is a noun; it means something that is lost–e.g. weight loss. The term “at a loss” is a figure of speech that is usually used with the word “for”–e.g. “I’m at a loss for words”. “Lose” is a verb that means “Fail to keep or to maintain; cease to have, either physically or in an abstract sense.” For example, “I am afraid I will lose my home if I keep gambling.” Lost is the past tense of lose. To confuse the issue further, “loose” is an adjective that means flowing, not tight fitting…as in “loose fitting clothing”. Got it?? Clear as mud. Thanks Michael. You can see how confused one can get, but this is very helpful. You can have a great day now that you’ve PASSED this knowledge on! so much. Its not only used in the incorrect manner 95 % of the time. It is overused . The word “quite” is the word that most people substitute “pretty for instead. Agree or disagree ? Increasing confusion between “notoriety” and “fame”. Notoriety is for fraudsters, embezzlers and serial killers. Fame is for the rest of us. “titled” vs “entitled” The book was titled. The author was entitled. Correct? The book I published was titled “Lord Allenby”. I was entitled to a free copy because I was the author. ‘Entitled’ is usually followed by ‘to’ or sometimes ‘by’ (“he was entitled by right of birth to inherit the throne”). I am happy to learn that I had been using “i.e.” correctly, but I’m afraid that it was more by accident than intention. I don’t think I’ve ever used “e.g.” before in my entire life, as to be honest: I didn’t know exactly what would be the correct usage. I know now, so that means that coming to this article today was educational. I sincerely appreciate the writer for that. This article is marvelous. I am a Business Blogger and I can tell you that I was missusing e.g and i.e, after reading this article everything is much more clear. A book is entitled (trans. verb) with a title (noun). The contract an author signs with a publishing company (hopefully!) entitles him to compensation for his work – two correct meanings/uses for entitle. What makes my hair stand on end is the fact that even the most distinguished authors do it. It makes me feel I am wrong. That’s a tough call. In doing a little online research, I was shocked to discover that the word “entitled” can actually be used in place of “titled” for a book, periodical, etc. However, the general consensus is that the correct usage is “titled” in that case. To make a final decision you may want to do a little research of your own. Actually I already looked into the proper word to use re books, magazine, etc. And I stick by the word “titled”. However seeing accomplished authors and even reporters use “entitled” gives me the feeling of being a round peg in a square hole. You know what I mean? My name is Joseph. But you spell it Joaseph. It gets on my nerves just like anyone whose name is misspelled. Right? That’s a cute graphic heading this article. Illustrates the concept perfectly. I’ve read all of these and have yet to see my biggest problem words lie, lay, laid and lain. I have been struggling with these since grade school and STILL can’t get them right most of the time unless I look it up. Also, I appreciate the i.e. versus e.g. reminder. another place where I often get confused. How about the common misuse of the word “hopefully”? As in “Hopefully it won’t rain tonight.” I understand that this usage is now so common that many grammar references deem it acceptable, but it still drives me nuts.